Popular free Youtube video downloader plugin for Firefox "Easy Youtube Video Downloader" is now available on Google Chrome platform, the free extension allows Google Chrome Web-browser user's to download Youtube videos in MP3, MP4, FLV, 3GP, 720p HD and 1080p Full-HD video qualities with a single-click at fastest download speeds directly from Youtube servers. Sadly, because of copyright issues official Google Chrome Extension Gallery denied accepting the extension but the addon is now available for download at Yourvideofile.com website where you can find all Google Chrome Extensions not available at the official source. 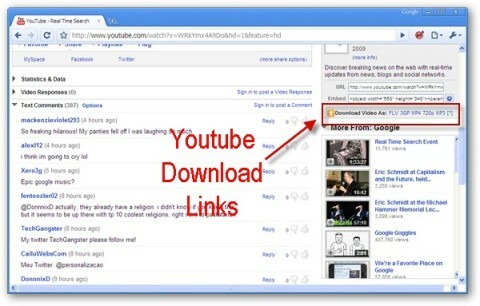 Go grab Easy Youtube Video Downloader for Google Chrome and start downloading those videos. This extension does not work anymore with the latest design change or am I the only one who can't see download links anymore? I actually use another extension for getting my mp3's but I really would like to use this one again because I also want to download the videos instead of just the mp3 files! you're not the only one, but do you have any suggestions of software or plugins or whatever i could use to download youtube vids on an Ubuntu OS? which one do i know to choose? flv, 3gp, mp4 or mp3...what do these mean? flv, mp3 3gp and mp3 are just file extension names of the file. basically its all video files. FLV is a flash video, 3gp is a video format generally created by mobile phones and one I find annoying to edit with because I have to convert most of the time, mp4 is fairly standard video format and mp3 is for capturing just the audio from a YouTube video. It works fine with Chrome n the new Youtube layout. But the links for the HD versions doesn't show up. Anyone have the same problem? Don't have problem with links for flv, mp4, 3gp, n mp3, though. 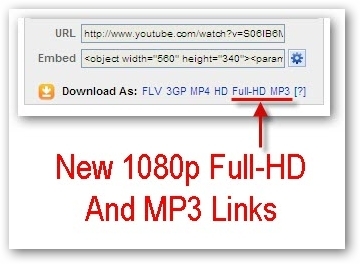 Google Chrome "Easy Youtube Video Downloader" is now updated to v 3.0 and works again after latest Youtube changes. mp3 option doesn't even work.... right click saved link as just saves the "php" file of whatever. Dont right-click and save the MP3 link, you need to left-click for mp3 download to work - this will be made clear in next update. When I try to download as flv file, it only saves as a 'file' file. after download on mobile, when i open the video from my mobile (3gp format) its showing "there is problem opening the file.try again?" No mention is made anywhere of this, or how the extension can be configured to download to the folder of the users choice. Perhaps it downloads to your Chrome default download folder? My problem is that whenever i try the damn thing it doesn't download. It takes me to an error page. where does the downloaded video go to? Every time I try to download a video it just downloads a file called "get_video.htm". same..its really weird and quite annoying, can someone please advise? As stated previously, this is no longer working. All month long, all options but "mp3" have been trying to save as "get_video.htm". Oh, and the MP3 option hasn't worked for a little longer, but i didn't care. http://www.youtube.com/watch?v=7zZainT9v6Q to save at home so I can practice throat singing alone. Update to v 4.0 to make it work again. WOOHOO! Latest Chrome version with version 4.0 of this jewtube downloader. First of all I would like thank the developer(s) for building such a great add-on. Well, the 3gp download format is not available anywhere so I miss it soo much. Please do something quickly. Well, the MP4 (360*240) download format is not available anywhere so I need it so much. Please do something quickly. This is a great plugin, but I have a problem. I am using Chrome + Orbit Downloader + DM-Bridge (oGet) for integration, but no matter what I do I can’t get Orbit (or any other DM for that matter) to download the YouTube files generated by this plug-in, it always uses the built-in Chrome download manager. Does anyone know a workaround? This is no longer working with Youtube and google chrome for some weird reason. I flushed DNS, cleared cache, history etc still not working. I hit the download button and it takes me to a very long url and white page. Looks like YouTube has upped their Security again and Easy YT DownLoader no longer works. This is the only software I'm really willing to use as it works so cleanly and I don't get any "sleazy" feeling off of this at all. The redirect upon clicking "Download" as any format is a long link, and sadly loads only a white screen doing nothing else. I'm willing to help if it's needed but I hope a quick patching is all that we need! Thank you to the Dev Team for your hard work!! The redirect upon clicking "Download" as any format is a long link, with ID expire in it,and only loads a white screen doing nothing else. I cant download a 3gp file cause it does not appear on the download addon.. what should i do.. that video is not hd, but just a simple video.. how? after one day it wont let me download anymore songs? All last night i could download all of the songs that i wanted and then like this after at like 5pm and i tried to download the song, the song downloaded and when i went to go and play the song, the song wouldn't play, like as if the song was blank, Si could someone please help with this, cause i really dont understand why i cant download anymore songs that will play on itunes. thank you so much, so could you please help me. I used to be able to download videos on firefox using the free download manager which monitors youtube videos easily. ihad searched youtube sometime later i found youtube. What is FXSAPIDebugLogFile.txt in your temp folder and how to delete it ? American Pie Beta House 2007 Leaked Before Release !! [Solution] Redsn0w Shows Error "Unable to Recognize Specified IPSW"